KEEP'n LOCKED ON BRIGHT!!! RESPECT!! Word, Life. Good to see OC still spitting verses! That horn tho!!!!! Lawd have mercy! Absolutely LOVE this beat! @derek-dub: Yes it is. DITC. He is very alive. absolutely so freaking dope !!! The rest of the team too, great track, One Love ' . Ohhh, Ol'Droog is Crazy . 3 of my favorite emcees on this ill track! I love it!!! Buy DJ EFN feat. 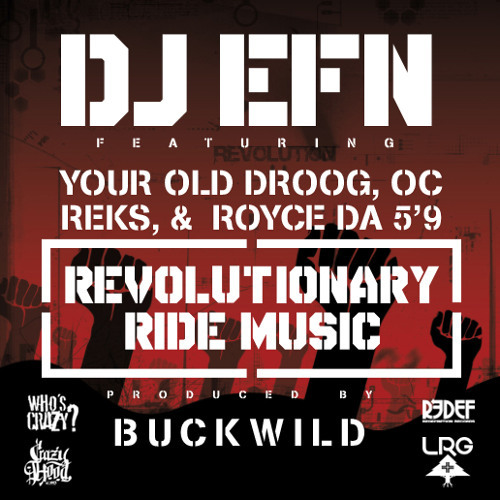 Your Old Droog, Royce Da 5'9, OC, Reks - "Revolutionary Ride Music"
Users who like DJ EFN feat. Your Old Droog, Royce Da 5'9, OC, Reks - "Revolutionary Ride Music"
Users who reposted DJ EFN feat. Your Old Droog, Royce Da 5'9, OC, Reks - "Revolutionary Ride Music"
Playlists containing DJ EFN feat. Your Old Droog, Royce Da 5'9, OC, Reks - "Revolutionary Ride Music"
More tracks like DJ EFN feat. Your Old Droog, Royce Da 5'9, OC, Reks - "Revolutionary Ride Music"